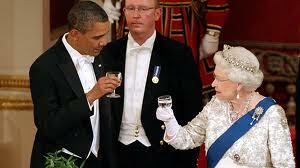 A round-up of the coverage so far from America on Barack Obama's state visit to the UK. President Barack Obama, leader of the free world and its undisputed political rock star, was all over the UK media before he even stepped off the plane in Ireland, let alone arrived in this country. In America, however, they have taken something of a more laid back approach to his visit. One of the main points of interest appears to have been the table tennis the President and David Cameron took part in, the stand-out photo moment so far, complete with high five. The prime minister demonstrated his Etonian insouciance by hitting the ball with one hand while his other was in his pocket; the president demonstrated his keen athletic instincts by appearing to blatantly poach one of Mr Cameron’s shots. Anyone who has seen the game would know this was probably a matter of necessity given Cameron’s ineptitude, how he got that high five we’ll never know. Older and wiser now, the Obamas this time gave the queen a handsome collection of memorabilia from her parents’ historic visit to America in 1939. The US media, not as renowned for adversarial treatment of leaders as ours is, did mention as least one gaffe however. The Obamas visited Westminster Abbey and laid a wreath at a tomb, surrounded by poppies, in memory of “the unknown warrior.” Obama wrote in the guest book, “It is a great privilege to commemorate our common heritage and common sacrifice,” but added the wrong date, “24 May 2008. This story was picked up, unsurprisingly, by Fox News on their Fox and Friends show, as reported by Media Matters. The Fox presenter put the matter down to “a lot of miles and a lot of Guinness”. However another Fox pundit/horrible troll wasn’t quite so forgiving of the President enjoying Irish hospitality. People tuning in to the show were treated to Bolling ripping Obama for “entertaining rappers” at the White House and “chugging a few 40’s.” MSNBC’s Ed Schultz and Think Progress criticized Bolling for a racial tinge to these attacks. The Huffington Post went with photo-coverage of the trip. Perhaps, as one BBC reporter commented, sensing the trip could be covered “with the sound down” such was the balance between symbolism and substance. Photos of the the meeting between first lady Michelle Obama and the duchess of Cambridge are one of the more popular sections on the site at the moment. The meeting even warranted an outbreak of exclamation marks from the writers. In a similarly excited tone, The Times reported that the royal couple were “one of the few couples in the world even more famous than they (Barack and Michelle) are”. Not quite true surely, but further testimony to the esteem America hold our royal family in.